We had one full day to get a feel for Warsaw, and Renata did it! We had previously sent her addresses of relatives' childhood homes and she found them! We drove from the royal palaces to Old Town, from across the river to new modern business districts. We saw traditional, cutting edge, trendy, everyday, and ghetto, all aspects that made Warsaw come alive. We followed Renata's great recommendations for souvenirs and restaurants. It was a whirlwind and wonderful day. BOOK IT ! Because of our family histories, this was a special day for us. Renata was a wonderful tour guide. She had checked out times, places, and dates beforehand so we were fully prepared. We combined Treblinka with a nearby restored synagogue and a lunch at a small authentic restaurant. Renata knows her history, is enthusiastic and realistic about sharing it, and is a great driver- all needed on a long day!. We had a wonderful all day tour. Renata was an excellent guide and very knowledgeable. We saw more than we thought possible. I would highly recommend Renata and would love to take another tour with her when we return. We contracted with Renata for tours in Warsaw on 6 and 7 Oct 18. As per our request, Renata designed special tours for us so we could visit as many Warsaw sites as possible. Renata met all our expectations as a tour guide and provided us with many excellent and detailed descriptions of the various Warsaw sites. If a specially designed tour of Warsaw is on your agenda, we highly recommend Renata as a tour guide. Based on our experience, we give Renata a rating of 4.5 out of 5. Excellent and very friendly guide, who clearly enjoys her work. Highly recommended! We had a good tour with Renata. She was very knowledgeable and had a good sense of humour. We saw a lot of the city that we would not have seen on our own. Renata knew her stuff. Was flexible, pleasant and showed us the highlights we wanted to see. We like using tours by locals to get that personal feel on our tours and it's nice to be able to change something along the way or stay for as long or short as you want. A comfy car too. Renata is a great guide with a very high knowledge of Warsaws history. Besides her friendly way of presenting her town, we enjoyed the variety of driving and walking. Thanks again. Absolutely to be recommended. Renata was knowledgable , thorough, and very friendly. We would definitely recommend her to our friends. Renata was all we expected. Renata was wonderful. This was just what we hoped that it would be- a quick and informative view of this beautiful city that has such an important place in the worlds history. We would definitely recommend this tour to all. We should definitely recommend Renata. We saw a peacock and an impromptu Chopin concert by a fellow tourist at the Holy Cross Church. Very serendipitous!!! Great Day!! Renata gave a very good tour of Warsaw. Her English is good and she will give you historical information on all of the sights. It is well worth the reasonable costs if your time in Warsaw is limited. Renata met us on time and we began the tour in a clean, comfortable car. She told us about the area in which we are staying and made a great stop to the university library and their roof garden, an excellent space that I would have missed. We then proceeded to tour the rest of the town - at times walking and at times driving, and she was a wealth of information about the history and modern city. Renata was instrumental in the success of my tour. She helped me find relatives and was a great interpreter! Thank you Renata! TOUR GUIDE RESPONSE: Thank you, for me it was also great satisfaction to make the family reunited. All the best! Renata is a very good Guide. She knows her Warsaw. She modified the tour to fit our needs. My brother was with us and he has special needs. she was very accommodating! She took us into two Palaces that where not on the intinary which was my request. We had a great time! I would hire Renata again! Renata was an excellent guide, very knowledgeable and expansive across a range of topics, not just the subject of Jewish Warsaw. TOUR GUIDE RESPONSE: Thank you for words of appreciation. I enjoyed your company too. Renate was thorough, friendly, patient with the older members of our party, knowledgeable, and imparted her love of her beautiful city. We felt we had a good overview of the cultural and historical highlights, and a sense of life in Warsaw. We never would have been able to acquaint ourselves as well on our own. In short, we would highly recommend her! Renata did a great job. She was very knowledgeable and very nice. I personally found the pace to be a little fast for me, a bit rushed at times. Renata was so professional and nice. She was very knowledgeable about history of Warsaw. Thank you Renata for a great experience. Renata took a long time to warm up and finally indicated she had personal issues weighing on her mind. While I'm sorry for her personal situation, maybe she should not have signed up for the tour. I never received the message she said she sent regarding the sabbath closure of a number of the sites we were supposed to see - this was also unfortunate. The tour worked but it was disappointing not to see the cemetery or the synagogue. While there is not SO MUCH to see at the Treblinka site itself, going there with Renata is what made this a highly worthwhile experience for me. She has tremendous knowledge of the history involved, but just as valuable to me was her insight into life in her country and life itself. I make a point of visiting places such as this in my travels, it is not something I would characterize as fun. Even so, I can honestly say I truly enjoyed the tour. Thanks Renata! Renata was extremely informative. We had a wonderful professional tour. She adapted and accomdated the tour to our interests without leaving out any of the high points and hidden treasures of Warsaw. She is personally a delight. Thank you for showing us your beautiful historical city. Renata is very knowledgeable, well organized, and very accommodating. She provided an excellent tour. Highly recommended. TOUR GUIDE RESPONSE: Thank you for words of appreciation. It was my pleasure, too. Renata was a true professional. Available prior to tour via email to customize and confirm tour details. Renata was knowledgable and extremely informative throughout. I highly recommend the city tour with Renata. We just finished our tour with Renata in Poland and we couldn't be happier. Renata was so well educated on the history of Poland, specifically concerning Jews which is what we had asked for. Additionally, she was so accomodating and made sure we got to see everything we wanted, including our family's hometown of Lodz. She really went above and beyond, we cannot thank her enough for this wonderful and meaningful trip!! We will definitely be recommending her to family and friends back home!! Always on time! TOUR GUIDE RESPONSE: Thank you so much for words of appreciation. I am happy too, that I could show you as much as possible during 6 days of your visit to Poland. Still a lot remained to be seen, so - till your next visit! TOUR GUIDE RESPONSE: Thank you. Assisting you in tracing steps of your family was also for me great experience. TOUR GUIDE RESPONSE: Thank you for your opinion. Since you express it four months after the tour, it means that it has been unforgetable... For me as well. Informative and knowledgeable, especially about history and culture. Sensitive to our particular desires. Worked hard. Renata was pleasant and seem knowledgeable but left me feeling she could use more customer service training. During my 8 hour tour she received and took many telephone calls from potential and current customers often interrupting our conversation. I felt she Renata was too distracted by her future customers to focus on her current one: me. Renata was professional and friendly . We began our tour of Warsaw with an extensive coverage of the city. Renata displayed a comprehensive knowledge of the historical aspects of the city which made it very interesting and we now have a better understanding of present day Warsaw. Would definitely recommend her tour. Wonderful tour and information about a horrific tragic event. ENjoyed the countryside as well. Highly recommend everyone visit Treblinka. We had scheduled with Renata for 2 days. .two tours. SHe was wonderful and very knowledgeable..and pleasant. We only had two days in Warsaw and felt we received a lot of histor and information. Highly recommend Renata! We were delighted with Renata who is knowledgeable, personable and altogether excellent as a guide; we could have happily spent far more time in her company. Renata was a wonderful guide, knew all about whatever we asked her. She also very kindly bought tickets for us for the train to Krakow when we left and also arranged transport for us to the train. She went out of her way to make sure we saw the things we wanted to see. TOUR GUIDE RESPONSE: I am glad that I could help ypu with arranging your trip. And satisfied that you appraciated it. Thank you, too. Wonderful day spent with Renata! We appreciate her knowledge and expertise. The only way to see Warsaw is with her. Chopin tour and the countryside was so interesting and lovely. We loved this tour with Renata! She is so knowledgeable and was extremely gracious to us during the entire tour. We only speak English and she speaks several languages. We had no problems at all understanding everything she told us. Fascinating city and wonderful tour guide! We enjoyed our Warsaw City tour with Renata very much. Her car was comfortable and clean. She knows her way around town very well. The tour was well planned and thorough. She is knowledgeable and enthusiastic. Thank you Renata! TOUR GUIDE RESPONSE: Thank you for your kind words. I will gladly meet you next time when you bring your childen to show them Warsaw. My local guide was wonderful. It was a pleasurable experience with the ToursByLocals service. TOUR GUIDE RESPONSE: For the first time I have met the tourist from abroad who knew such a lot about our country and its history. What's more - who was so eager to learn and see more. It was a real pleasure to guide you. The tour went as well as I expected and more. I strongly suggest tourists to use ToursByLocals. You can arrange your own itinerary. It works really well and is reliable. TOUR GUIDE RESPONSE: I am sorry that I disappointed you.I see that I have to improve my means of communication so that any misunderstanding,especially in recognizing my intentions will not spoil the contact with tourists.My unfortunate remark that probably you are not interested in detailed stories of PolishJews expressed my intention not to be boring.I did not know about your family past;usually tourists say that which is much help to us.Hoping that nevertheless I showed you interesting sides of Warsaw. I made a trip to Poland to see the town of my Great Grandfather and to experience as much of Poland as possible, to know a bit of what my Great Grandfather's life might have been like. Renata planned a great trip to see some of Warsaw, the countryside and ultimately a visit to my family's village. The trip was all that I had anticipated - and more. I highly recommend her as your guide. We arranged a 4hr city tour of Warsaw with Renata on LESS THAN 24 hours notice. I was astounded at how straightforward the booking was, how helpful the service was, and how everything went off as planned without a hitch. Renata is definitely a 5/5 guide and it is obvious that she is experienced in this field. She was punctual, professional, accommodating, and incredibly knowledgable. It was like being toured by an old friend! So thank you for your service, it is one I would definitely look to use again! We only had one full day in Warsaw and this was the perfect tour. We saw so much and still had time to explore afterwards. Renata was great: punctual, extremely knowledgeable, and friendly. She took us to all of the main sights and gave us a personal private tour of each. Do not miss Wilanow Palace. It is gorgeous both inside and out with lovely grounds (garden). It took only about 15 mins or so (by car) from the old town, definitely worth it. Highly recommend this tour and Renata! I enjoyed my tour with Renata. She was a pleasure to be with and is so knowledgeable about Warsaw, its history, architecture and art. Her tour was a wonderful introduction to the city and the beginning of a great visit to Warsaw. Renata is super friendly and has a ton of knowledge to share - she arrived right on time, had lots of knowledge to share, and was a pleasure to have as our tour guide. Highly recommend her! TOUR GUIDE RESPONSE: Thank you for your comment and specially for chosing me for the second time. The third one would be warmly welcomeed. Very pleasant informative and willing to adapt. Good English language skills and she knew the country well. Enjoyable day. We booked Renata to take us to the villages where my wife's family had come from. What a successful day we had! We found three families of relatives we had lost contact with. Our success was attributable to the preparation Renata did , and her ability to navigate and interpret for us. Well done Renata! TOUR GUIDE RESPONSE: It was great satisfaction for me, too. Best regards for the whole family! We enjoyed our tour very much. TOUR GUIDE RESPONSE: And I enjoyed your company. Renata's knowledge of every architect of every building and the accompanying history was more than impressive. The way she relates the sights to Warsaw and the people make it more than enjoyable and educational. She is a great guide and we thank her for another wonderful tour. Renata's overall knowledge of Poland and the Jewish population is very impressive. Her information is factual and her approach both professional and personal. She is a fabulous guide and we thank her sincerely for a most memorable tour. Very interesting tour with a very knowledgable guide. Good selection of points of interest. Great mix of walking and travel by car so that many sites were visited in a short space of time. Good commentary on historical aspects as well as contemporary information. Highly recommend Renata early in stay in Warsaw to gain insight into overall impression of the city. Very knowledgeable and informative--and very kind to drag around the city with me when my camera broke--i really appreciated that--she was not obligated to do that, so credit to her for it. only problem for me is that two places I requested to visit, one requested well in advance, were closed on the days that she scheduled the visits. So maybe you just need to check for yourself if something is important to you. Again---she was very nice and flexible and was a good tour guide. I can only give Renata and the trip five stars. It was wonderful. She was very knowledgeable and strove to please me. She went out of her way to show me Jewish Warsaw. She also has a great sense of humor and was a delight to spend time with. Renata is very knowledgeable about Warsaw and she is a joy to be around. We went over the first day by 45 minutes, but she didn't say anything. We tried to go shorter today to make up for it, but she's so easy to deal with she doesn't make you feel guilty. Definitely would highly recommend Renata! We thoroughly enjoyed tour two days with Renata. She is attentive to our needs and I don't think we missed anything in Warsaw. She is easy to work with and speaks English well. I enjoyed the tour very much. Renata was friendly and knowledgable about all the included sites. I would not hesitate to hire her again for guide services, and I feel comfortable recommending her services to other new tourists to Warsaw. We booked Renata for three very busy days in Warsaw and rural areas. While our itinerary was ambitious, her planning was perfect - we were always well paced, covering all the areas of interest. Renata shared her knowledge and insights in a way that enhanced the meaning of what we were seeing and experiencing. She expertly blended our car and foot travel with more than ample opportunity for up close touring, never rushed and always more then enough time to linger at important places. Great experience! Renata is an excellent and well informed guide. She is an interesting person in addition to her knowledge used in guiding tours. The park surrounding Chopin's birthplace is one of the most beautiful places I have ever been. Her voice is slightly soft, so persons in the back seat may want to ask her to wait until they are out of the car to tell them tour information. Renata was wonderful! Her English was perfect and she entertained us during the ride to our destination, providing information about Poland and answering our questions. She was took us to all the places we asked, even the cemetery, and patiently helped us look for headstones! 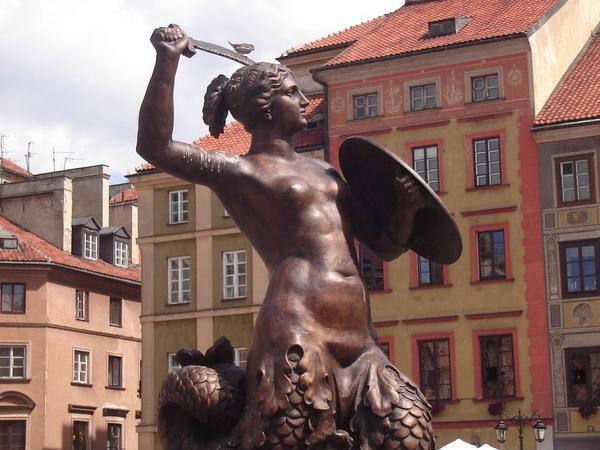 I would not hesitate to use her as a guide in Warsaw and beyond! Renata was just wonderful! She personalized our tour according to our wants and needs. When in a very small town she interacted with locals in order to make sure we saw all the things we wanted to see. she was very dependable, EXTREMELY knowledgable and just an all around pleasant person to be around. We spent two full days with her and would gladly use her agin as a tour guide and recommend her to friends nd family. I was very happy with the service i recieved. Renata tour was how i wished and she helped me greatly with my needs. Excellent guide! Renatata was very knowledgeable and pleasant. I will definitely use your company again. We spent 6 days with Renata. She was an awesome tour guide and a very easy person to be with. We made the most of our time without rushing. We were comfortable and she was attentive to our interests. You never know when you hire a guide for that long if you will be compatible. I believe Renata could be compatible with anyone. She also went out of her way to find an ancestors grave site. We will recommend Renata to our friends interested in visiting Poland and we will hire her again in the future. Renata was a wonderful tour guide. She made sure we saw the parts of Warsaw we really wanted to see and more. She was very knowledgeable about the history and current events. We had a wonderful tour! Very personal and relaxing. I would highly recommend this tour for anyone who wants to get to know the city and doesn't want to travel on a bus to do it!! Great knowledge of the area and history. English is at high level. Had a great time, thanks Renata. Renata came to my hotel on time as planned. She drove us to Ostrolenka, my folks' home town, where she took us to all the sites I had previously requested. She took us to the Records department at the City Hall and tried her best to get us information, with the clerks who were very cooperative. I would not hesitate to reccommend her to anyone else as a guide and translater. This was a continuation of our morning City Tour. Renata showed again her good qualities: knowledge, intelligence, and willingness to adapt to our needs.She had prepared in advance the visit to the Jewish Cemetery so we could locate the graves of my late husband's ancestors. I appreciated very much her help in this regard. She is an excellent guide. Excellent tour. We saw the places we were interested in and learnt much of Polish history. Renata is a well informed, intelligent guide. She has a rich educational background that is evident in her explanations. She was friendly and understanding of our preferences and some physical limitations. We enjoyed viewing several beautiful parts of Warsaw. This was an excellent start to our short trip and put the area, politics and people into context and prospective for us. We would certainly use ToursByLocals and Renata again (if we have the chance).